Distribution and habitat: Saxifraga stolonifera is native to Asia but has been introduced to other continents, mainly for use as an ornamental plant. 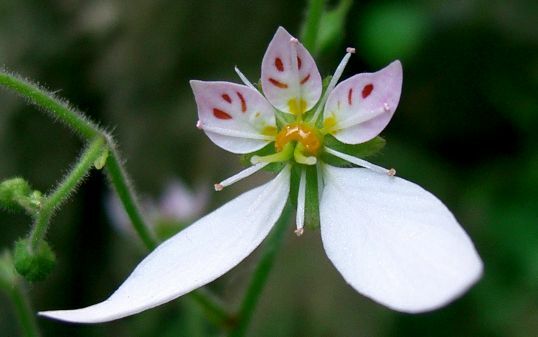 In its natural habitat Saxifraga stolonifera is found in forests, scrub, meadows or shaded rock crevices growing as a groundcover, spreading quickly by its runners that readily make root. Description: Saxifraga stolonifera is the only one species suitable for use as an indoor plant. It is a stemless plant that grows no more than about 22cm (9 inch) tall with loose rosettes of almost circular leaves up to 10cm (4 inch) across, graceful flowers spikes and attractive trailing shoots that carry miniature plantlets. The leaves are deep olive green, roundly toothed, netted above with fine veining and coloured reddish purple beneath. They are borne on leaf-stalks up to 10cm (4 inch) long and the stalks as well as the leaves are covered with short, soft hairs, which are reddish when young but gradually turn green. The red, thread-like stolons which bear the little plantlets closely resemble strawberry runners. They are of varying lengths – sometimes as much as 90cm (35 inch) long; They merge from the centre of the plant and they occasionally divide into several threads. Some of the plantlets at the end of the stolon remain small while attached to the parent plant. Others grow larger, often attaining proportions almost as great as those of the parent plant and can readily be used for propagation. The flower spikes, which are up to 45cm (18 inch), are produced in late summer. They carry loose clusters of star shaped flowers which are white with a yellow centre. Each flower is about 2cm across with two of its petals appreciably longer than the rest. 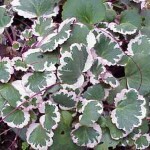 Light: A little direct sunlight every day (an hour or two of the early morning sun, if possible) helps Saxifraga stolonifera plants to keep their leaf colouring, but do not place them in hot, prolunged sunshine. 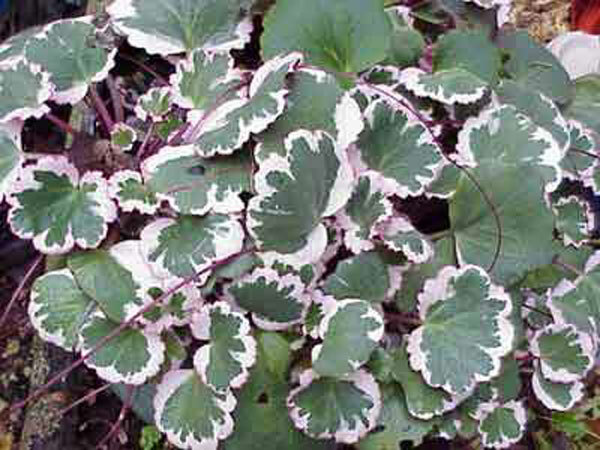 The variegates leaved Saxifraga stolonifera ‘Tricolor’, however, must have at least three hours a day of direct sunlight or the leaf-stalks will become long and spindly and much of the leaf contrast will be lost. 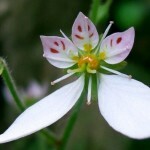 Temperature: Saxifraga stolonifera grows best in fairly cool conditions – ideally 10-15°C (50-59°F). It can however tolerate somewhat higher day temperatures during the active growth period (from spring to late autumn). Saxifraga stolonifera ‘Tricolor’ will thrive if it is kept in normally warm room temperature throughout the year. If indoor temperatures rise above 18°C (64°F), all these plants require high humidity. 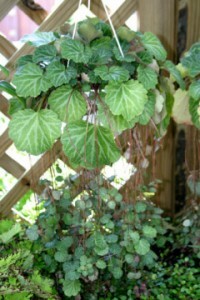 Stand potted plants on trays with pebbles kept permanently moist and suspend dishes of water under hanging baskets. Keep plants in a well ventilated position, but out of droughts. Minimum tolerable temperature: 5°C (41°F). Watering: During the active growth period water Saxifraga stolonifera plentifully as much as necessary to make the potting mixture thoroughly moist, but never allow the pot to stand in water. After plants have flowered, gradually reduce the amount of water given over a period of about two weeks. During the rest period give only enough water to keep the potting moisture from completely drying out. Fertilising: Give standard liquid fertiliser once a month during the active growth period only. Potting and repotting: Use a soil based potting mixture. For extra drainage put a 2cm (0.7 inch) deep layer of clay pots fragments in the bottom of containers. In the spring move the young plants into pots one size larger if they need to. Old plants become staggly and so these plants are not normally retained for more than two or three years, especially since young plants not only look better than old ones, but begin producing plantlet-bering stolons early in life. Propagation: Propagation is extremely easy by means of the stolon-borne platlets. Detach from parent and plant them individually in 5-8cm (2-3 inch) pots containing an equal-parts mixture of peat moss and sand. If the plantles are placed at a slightly shaded window in a warm room and watered just enough to make the rooting mixture barely moist, they will root in a few weeks and can be moved into pots of the standard mixture and treated as recommended for mature plants. Alternatively, leave young plantlets attached to the parent and anchor them down with pegs in contact with rooting mixture in nearby pots. Cut them away from the parent when they have sent roots into the mixture. Recommended propagation period is spring to late spring. Problems: Problems may appear mainly due to incorrect treatment. Yellowing leaves are caused by overwatering and poor drainage and there is little chance of recovery once the roots have begun to rot. Runners becoming brown is an indication that either the plant is being kept too dry or that the atmosphere lacks humidity. Saxifraga stolonifera ‘Tricolor’ (Magic Carpet) is smaller than other Saxifraga and its leaves, which have cream-coloured edges, turn rose pink if the plant is in good light. Saxifraga stolonifera ‘Tricolor’ is less vigorous than the original plant in terms of both rate of growth and of plantlets production, however. These plants are not dense enough to fill hanging baskets by themselves, but they look most attractive in small ganging pots, where their trailing shoots and decorative colourful leaves are displayed to full advantage. Use: Grow the plants in small hanging pots or trailing over the edge of containners and place them in spots where the delicate foliage will not be overlooked. This is another plant that does well when placed high up on a shelf, from which the runners can cascade down to depth of about 60cm (2 feet) in favourable conditions. Plants may also be grown indoors in windows or hanging baskets as houseplants – baby plantlets that form at the ends of the thin drooping stolons are very attractive. 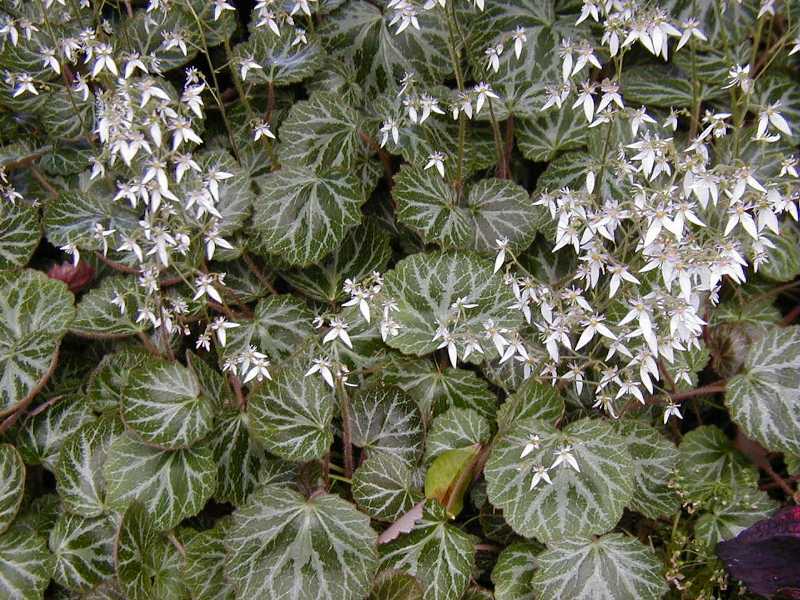 Where winter hardy, Saxifraga stolonifera plant forms an excellent ground cover for shady areas. Mass in shade or woodland gardens. Also may be planted near streams, ponds or fountains. A popular garden flower, it has attractive white blossoms with distinctive pointed petals and bright yellow ovary. 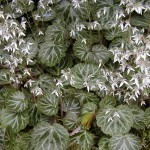 Saxifraga stolonifera is suitable for rock garden or woodland garden style.